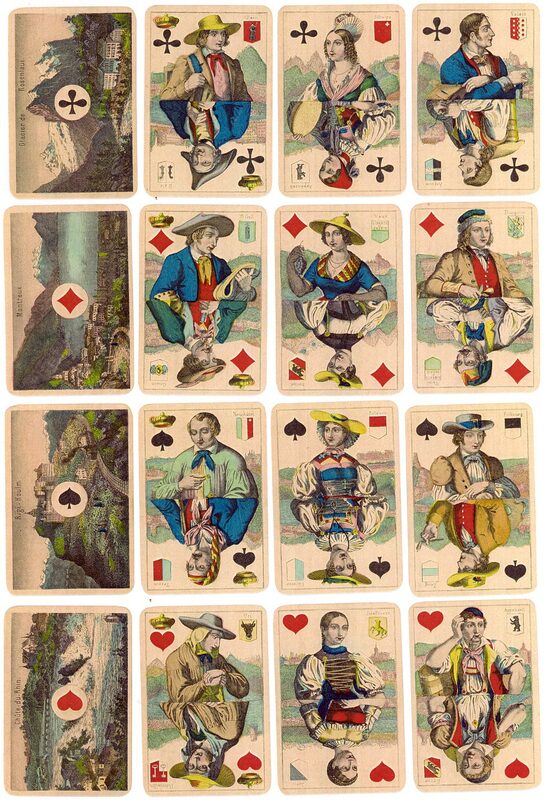 Regional Costumes Playing Cards with scenic Aces, made by Müller, c.1890. The local costumes are different at each end. Müller's recent investments in updated machinery were paying off and the company was now able to commence the export of playing cards to foreign markets. 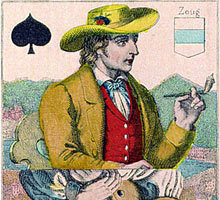 Packs with conventional courts and scenic aces were already being produced extensively by card makers in Belgium, Austria, Holland and France for the newly fashionable tourism business. The Aces would depict geographical or historical scenes. This Swiss Regional Costume pack can be seen as an early form of tourist souvenir which subsequently developed into the photographic souvenir pack.